When activating one of the files in the Grid View mode (double-click, press Enter on the file, Menu – View – Switch to single image) the program switches to Single File View mode. 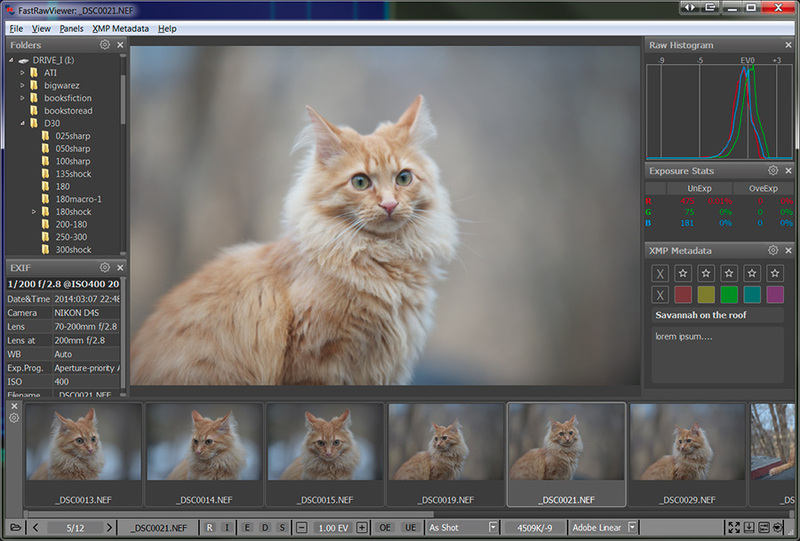 When choosing a file from this panel (using the mouse, arrowkeys on the keyboard, Menu – File – Next/Prev File and Last/First file) the selected file is displayed in the main window, and the controls of exposure, white balance, and contrast will act over this active RAW file (see below the “Working with a single image” section). Selecting a group of files and group file operations (copying, moving, labels, ratings, passing to external programs) is also possible.